Blaming everything but religion on religious intolerance. The comic Robin Williams once asked, “How uptight do you have to be in order for the British to tell you to get the fu*ck out?” He was talking about the Puritans and the beginning of American history. It may not be an accurate account of how things went down between the British government and this young Protestant break away religious group but the point is taken. This was a very uptight religious group, prosecuted for their fanatical ways. It is ironic that this small prosecuted group of religious extremists, once settled in the new world, would then turn around and prosecute those with conflicting religious beliefs. Academics have been struggling with the contracting ideas of America as the home of the free and its insistence that it is primarily a Christian nation. We are free to believe, but in order to make it America, we better believe in standard Christian dogma. I bet if we counted them all up, we’d find hundreds books devoted to our history of religious intolerance. Since 9/11 it seems you can’t walk into any bookstore without tripping over the latest theory on why we are so intolerant and what this has done to us as a nation. I’ve read a few. These authors have something to teach us, whether it is a plea for tolerance or a history lesson on religions clashes in America. The better ones are by authors who write as an attempt to hold a mirror to our society. If they makes us squirm it is only because we find ourselves thinking a long the same lines as those we read about. We may feel discomfort in our ability to identify with one type of intolerance or another. The job of these authors is to make us rethink our views. Professor Peter Gottschalk, of Wesleyan is not one of these authors. His book American Heretics Catholics Jews Muslims and the history of religious intolerance made me squirm because his idea(s) about who exactly is intolerant is questionable. I cannot for the life of me figure out what his agenda is, other than to be a published author. If I were his professor and he turned in any of these chapters as an essay, I’d question his ability to clearly define his point and ask if he may not in fact be showing signs of intolerance. In his chapter titled, “Fanatics: Secular fears and Mormon political candidates from Joseph Smith Jr. to Mitt Romney”, Gottschalk offers a far too long view that the Mormon history is fraught with political intolerance; that, due to no fault of their own, Mormons have had a hard time in American politics. Oh yeah, like Smith didn’t invite trouble everywhere he went. While it is true, Romney’s religion was talked about ad nauseam, it did not stop him from being on the Republican ticket. A point Gottschalk concedes: “None of these issues (what it means to be Mormon) played a significant role in the 2012 campaign.” So why did write this chapter Professor? What was your point? It would have made much more sense to have a chapter devoted to the struggles of religious minority candidates and include Kennedy and ever other religious political first. Gottschalk spends so much time on Mormonism and politics readers may wonder if this is an argument for Romney 2016. My least favorite of his chapters is titled, “It’s not a religion, it’s a cult: The Branch Davidians”. Here Gottschalk does offer some interesting ideas on the word cult and its modern connotation: “The label ‘cults’ suggests that the application of the word says more about those who apply it than those it purportedly describes”. His point is well taken. Too often we label a religion that we do not understand or feel comfortable with as a cult. Gottschalk then goes into the long history of the Branch Davidians and gives a blow by blow account of the disastrous siege of the Davidian compound by the U.S. government in order to convince readers that the government’s intolerance of cults led to the death of innocent people. While I do not disagree the government used unnecessary force, Gottschalk never considers why they did. Gottschalk failed to consider that the government may have had Jones Town and Rajneesh (Antelope Oregon) in mind when they decided to take action. What bothered me the most was Gottschalk’s link to the disaster of Waco and the Oklahoma bombing. He says, “..the disaster at Waco represents an imperious government’s massacre of those asserting their rights of religious expression and gun ownership”. He then goes on to talk about Timothy McVeigh and how this massacre led him to bomb a government building. It does not occur to Gottschalk to explore the possibility that it is the fanatic who calls himself a Christian, yet demands to be armed to the teeth, that is the problem. I don’t know about you, but I don’t think it is Christ who said, “You can have my gun when you pry it from my dead cold hand”. If I remember right, he said, “love your neighbor, turn the other cheek and the meek shall inherit the earth”. Timothy McVeigh was a very angry young man that was looking for any reason to get back at the government he thought had wronged him. If Waco had not happened something else would have set him off. It would have served Gottschalk better had he noted that religious fanatics and weapons are never a good mix. 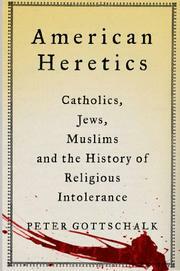 Some of Gottschalk’s chapters do offer historical accounts of religious intolerance yet he fails to look deeply at the root causes of these cases. He fails to show his readers the reasons Muslim extremists hate the western culture or how some Christian leaders pushed an ant-Muslim view on their followers after 9/11. This is the heart of the problem with Gottschalk’s book. He blames everything but religion on religious intolerance. What exactly is Gottschalk from Wesleyan a professor of? History? Politics? Religion? Popular culture? Anthropology? From your damning and well argued review it sounds as though he hasn’t done any of them a service. That Gottschalk is a professor of religion doesn’t surprise me: too many of them just seem to be apologists for their faith. When I asked what was for me a deep question in a school RE lesson, about how we can really know any religious dogma is true, the Christian Brother weakly suggested that we fall back on faith. Faith that what the Church said was true was truly so! That was the point when Catholicism lost me forever.